Hello! 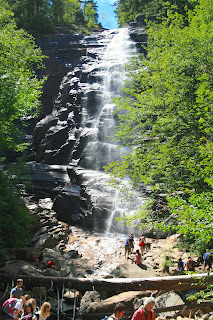 Today's post is a continuation of Day Two of my New Hampshire vacation. After touring Sabbaday Falls, we hiked back to our car and drove to Arethusa Falls. 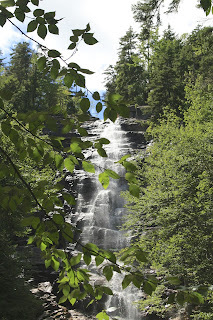 It was quite a different hike than our Sabbaday Falls trail. This trail is about 2 miles from where you park your car till you get to the Falls, and it is very steep and rugged. However, it is well worth the vigorous hike, because this is what you see at the very end. 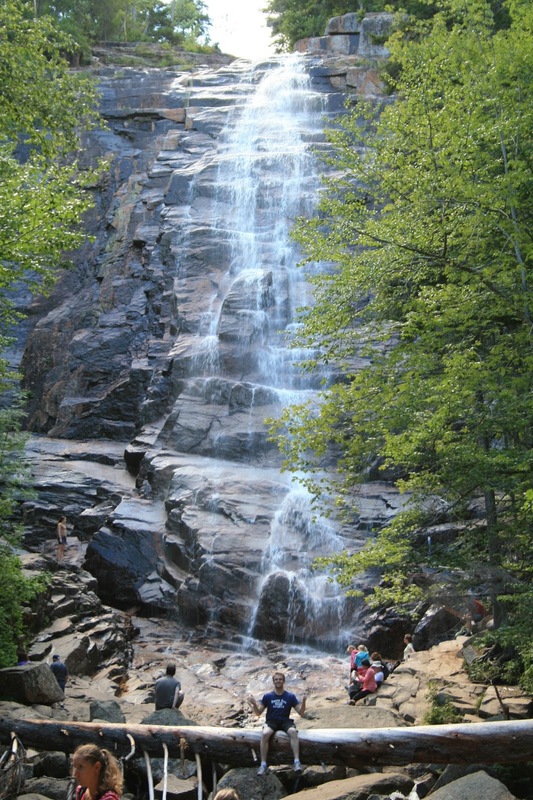 Arethusa Falls is the highest single water falls in New Hampshire, measuring in at about 176 feet. It is an absolutely GORGEOUS site to behold. When we reached the clearing to see the first site of the falls, my mouth just dropped open in awe. The sun was just emerging from the top of the falls, looking like a scene from heaven to me; It made the long, difficult trail all worth it! Here's an example of the rugged nature of these trails. Now these are actually man made steps of beams which are actually quite steep. I have long legs, and I still had to lift my leg all the way up to get to the next step. We did see one 'short legged young hiker' with an injury on the trail, because she had a previous knee problem that was aggravated by the steepness of this hike. The man- made steps pictured above, were actually quite rare on this trail. Most of the time, this was the trail (along with boulders and steep rock steps); lots and lots of tree roots to step around to avoid stumbling. Despite the difficulty of the trail, I did see several elderly people, children, and 'out of shape' people walking the trail. They just came well pre-pared with walking sticks, the right shoe wear, food, and water, and took lots and lots of breaks to rest. 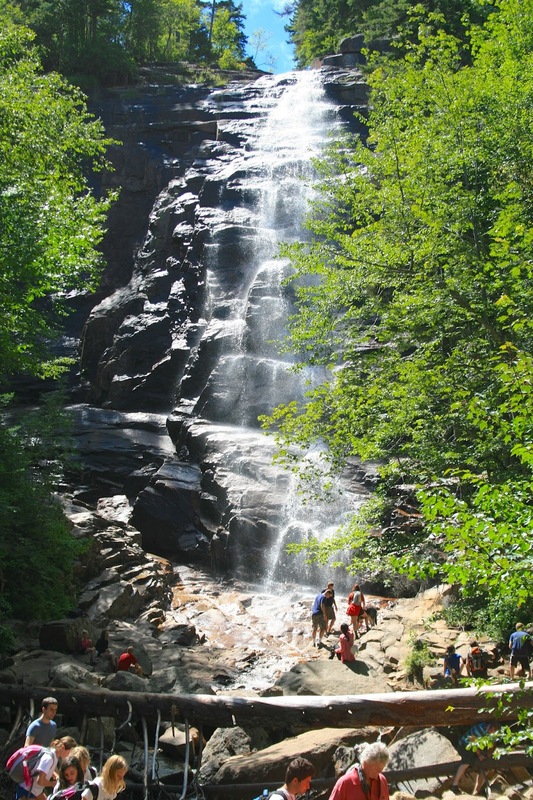 Below is a picture with people at the base of the falls so you can get an idea of the scale of the falls. 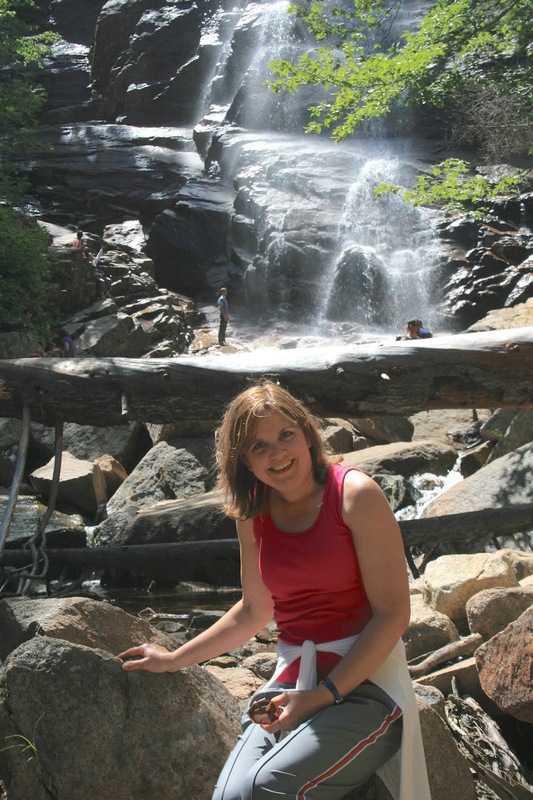 The jagged rock of the falls is so beautiful, and I love how the water just cascades down like a lovely mist. There was a downed tree at the base of the falls that many tourists were sitting on at some point. The tree really gives a great perspective of the scale of these falls. That is my son waving to me in the background. Here I am, exhausted, enjoying just sitting in the sun and taking in all the natural beauty around me. My son in law Jason posing at the base of the falls. 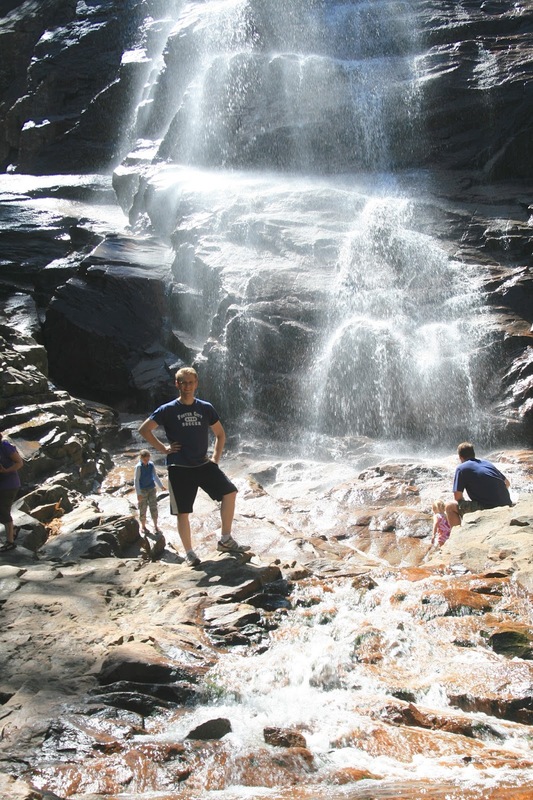 Now all three of my 'boys' (hubby, son, and son-in-law) are at the top of the rock (looking like ants) on the left side of the picture at the base of the falls. And finally, a picture of Jason sitting on the log at the base of the falls. This is a beautiful place ! It looks amazing! I love waterfalls!